even though my hair my hair was falling out like crazy for awhile there, it's stabilized now. it's not shedding, so now i'm trying to get it back to the fluffy mane it used to be. now, i'm not an expert. i'm not even a beauty or hair blogger. this is just what i found works for me after trial and error. but i'm hoping something in this line up will work for you too. step 1. apply Women’s ROGAINE® Foam daily. 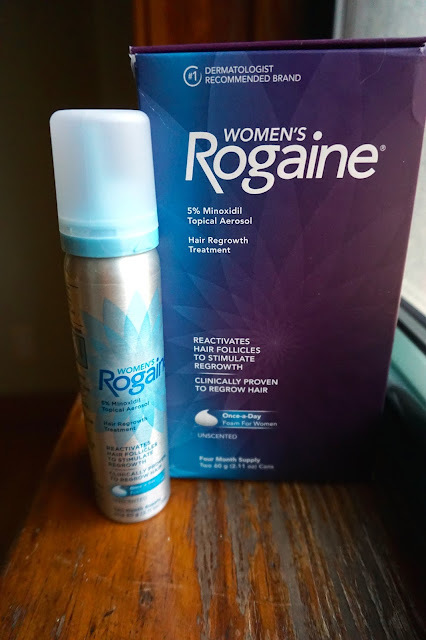 Women’s ROGAINE® Foam is the first and only FDA-approved once daily treatment with 5% minoxidil proven to regrow hair. it's easy to apply just once a day, morning or night (though i do it right before bed.) 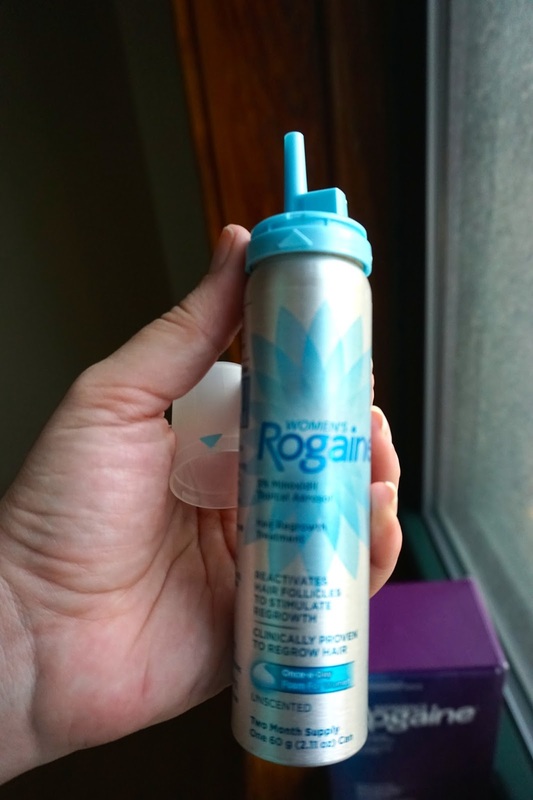 the foam can be used on chemically processed or color treated hair (my hair is highlighted!) and with any of the styling products i mention below because it doesn't leave any greasy residue. as i mentioned before, it's what my dermatologist recommended and i've been using it daily since. step 2. use a thickening shampoo and conditioner. i find that big from lush gives me really good volume, and the mane 'n tail conditioner leaves my hair feeling soft and healthy. i also use an apple cider vinegar shampoo once a week, just to get any build up off my scalp. 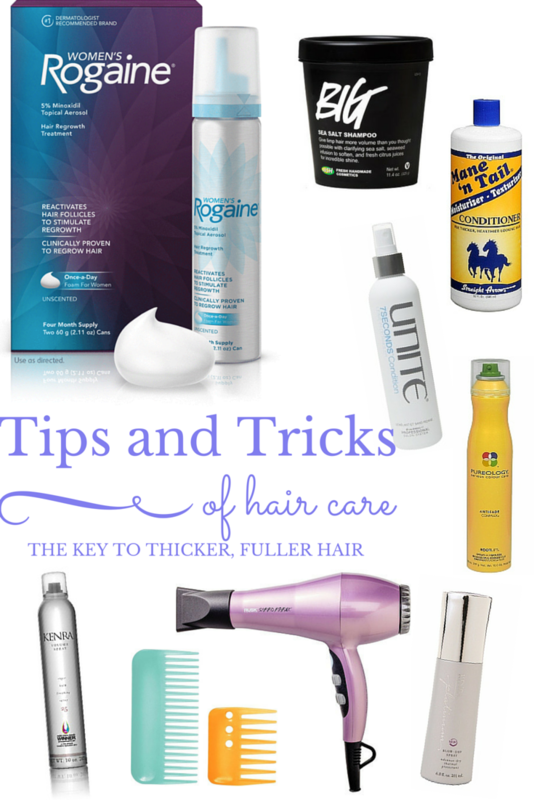 step 3. apply a root lifter, a leave in conditioner/detangler, and a blow dry spray. i use unite 7seconds as a detangler - this way, i'm not breaking any hairs trying to yank knots out. then i use a root lifter to put texture at the top of my head, and then a blow dry spray or lotion all over. this makes your hair dry faster plus it protects your hair from the heat of the blow dryer. heat is a bad habit for your hair, even just the blow dryer. step 4. use combs that don't hurt your hair. never use a regular hair brush on wet hair. i use a wide tooth cricket comb until it's mostly dry, then finish with a paddle brush. step 5. use a good blow dryer, with the diffuser attached, and dry your hair upside down. i use the rusk speed freak, and i have found that it dries my hair faster and with less frizz than the last 2 hair dryers i've had. it can be pricey, but i highly recommend it and you can usually find it on sale. drying your hair upside down directs the roots the opposite way so they lift up off your scalp, giving the appearance of fluffier hair. step 6. use a volumizing hair spray and don't mess with it too much during the day. 1. how do you know if your hair loss is normal or if it's really a problem that needs to be addressed? Jill: "A good test to see if you may be experiencing more than normal hair loss is to gently run your hand through your hair from root to end and see how many strands of hair come out in your hand. If its 6 or more, you may be losing excess hair." indeed, my dermatologist did this test - i failed miserably. 6? i had like 16-16 every time he touched my head! 2. what are some bad hair habits that can make thinning hair worse? Jill: "Bad hair habits for any hair type, including thinning hair, are to over work your hair with too much heat, tension and chemicals." i was right on this one! put the curling iron down. and the blow dryer. 3. what about my highlighted hair? should i stop highlighting my hair while i use the foam? Jill: "No, you can do both color and use the treatment, just space them a day apart and then continue your Women’s ROGAINE® Foam routine as usual." 4. what about salon care in general - should women with thinning hair stay away from colors and cuts until the problem improves? Jill: "Cutting and coloring can actually be a benefit while using this product as long as (and this is important) she is working with a well trained colorist and stylist." the right color and cut can hide the fact that you have thinning patches, but... it isn't a job for the newbies at the hair school. find a good salon. 5. what if i don't wash my hair? how does the foam interact with dry shampoo? Jill: "We recommend not going too many days in between washing especially if you also use hair products because the treatment is a scalp based application. So to get right to the scalp and penetrate is the key to its efficacy." okay, so it was good i asked this one. i'm as guilty as the next girl of turning to the dry shampoo too often. make sure the foam can get to the scalp! there you have it! my hair care routine for full, thick, fluffy, soft, non-frizzy hair. i hope it helps you too.